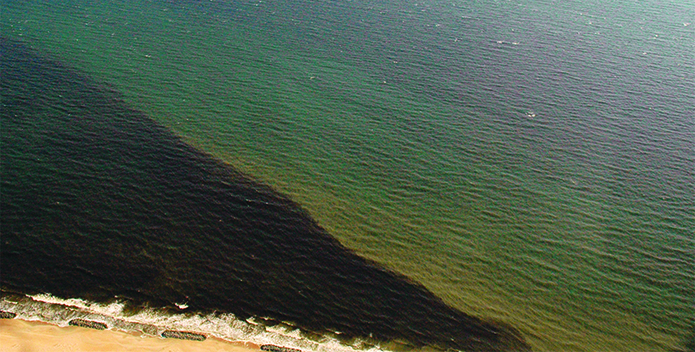 A Mahogany Tide near Cape Henry Lighthouse in Virginia Beach, VA.
"Do you see all that red water?" said CBF's Willy Agee on Wednesday, looking out at the open Bay from a second-story window in the Merrill Center. Indeed, the ebb current was carrying a reddish-brown streak of water out of the Severn River's mouth, around Tolly Point, and down the shore in front of us. Later that afternoon, I was on my skiff in the Severn River running a water quality profile from my skiff on Winchester Lump, the site of an oyster restoration experiment CBF is coordinating near the Route 50 Bridge. A Maryland Natural Resources Police officer stopped and observed that the colored water extended all the way up the Severn. He asked, "Is it a bad thing?" That's an excellent question. The short answer is that mahogany tides are a common springtime feature of mid-salinity sections in the Chesapeake and its rivers. The larger questions swing around the effects of such a huge bloom in a semi-enclosed body of water. The critter in question is a red-brown, single-celled alga of a class called dinoflagellates that can actually swim. This one's scientific name is Prorocentrum minimum, but it's commonly known as "mahogany tide." A healthy bloom means several million cells per liter of water. From what I could see in the water quality profile (see table), the bloom extended down to six meters, or approximately 20 feet. Think about a thirteen-mile-long river full of a thick layer like that. What is the tonnage of plant material here? The reason for my conclusion about the depth of the bloom is that the dissolved oxygen is very high down to that depth. It's supersaturated from all those algal cells photosynthesizing. They are busy absorbing sunlight, carbon dioxide, nitrogen, and phosphorus from the water, building it into their body tissues, dividing to make more cells, and giving off oxygen in the process. The catch is that when these cells die, they fall to the bottom, where bacteria decay them. Those bacteria use up oxygen in the process. The salinity is higher and the water temperature is lower at seven and eight meters. Both of those factors make the bottom water denser. The warmer, fresher upper layers act like a lid, sealing off the bottom water from the oxygen in air, while the bacteria on the bottom use up the oxygen that's there as they digest the dead algae cells. This stratification of the water column into upper and lower layers marks the beginning of a "bad water" dead zone. Winchester Lump now has a grid of 240 reef balls set with oyster spat sitting on it. The experiment, in partnership with the University of Maryland and the U.S. Naval Academy, tests the hypothesis that the bottom roughness created by three-dimensional oyster reefs can help break up stratification. We hope to see results in warm weather, when high summertime water temperatures drive oxygen out of solution. In the meantime, what lessons can we take from these mahogany tides? The first is to watch our waters carefully and ask questions. The second is to think broadly about what is occurring. Mahogany tides are natural occurrences here in the spring. And yes, scientists are seeing clear evidence that our Bay's health is improving. But a bloom as widespread and deep as the one recently observed in the Severn is a serious reminder of how much we have overfertilized our waters with nitrogen and phosphorus. Bottom line: the progress is great, but we still have work to do. 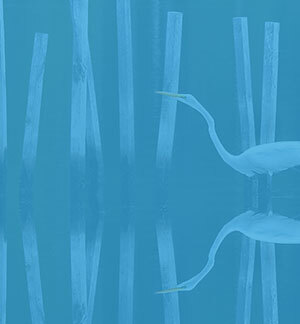 The Chesapeake Clean Water Blueprint still matters. Let's keep our hands on the throttles. For more on mahogany tides, check out the Facebook Live video below.